Thursday 26 Dec 2013. Visited Singapore's He Yue Zhai guqin shop / school with Leonard and Kenny (who are also students of Mr John Thompson). Leonard (who is based in New Zealand) is learning how to play the guqin from Mr. Thompson (based in New York) via Skype. Leonard is back in Singapore for vacation so Kenny arranged for us to meet up and visit He Yue Zhai together. I gifted to Leonard a new set of medium-gauge JinYu brand guqin silk strings so that he can bring it back to New Zealand and string them onto his ZhangYong-made guqin in his home. We met at Paya Lebar MRT station, walked to #02-05, 520 Sims Avenue and arrived at around 2:00pm. Right after we stepped into He Yue Zhai, it started pouring heavily so we played guqin until the rain stopped at about 4:30pm. It was really fun to be able to test play almost all of the guqins available in the qin school. There were really good quality guqins priced at SGD$580, SGD$980, SGD$1280, SGD$2680, SGD$3000 all the way to one which was priced at around SGD$9000. I believe this is the only place in Singapore where a beginner can buy a very good quality guqin at a very affordable price of SGD$580. Amazing. Of particular note was a Nan Feng brand guqin priced at around SGD$1800++ and another Nan Feng brand guqin priced between about SGD$8000 to SGD$9000. They were loud and the gravitas (heavy bass sound) were superb.... they sounded very promising for use with silk strings. We also chatted briefly with the person in charge of the qin school Maestro Zhong Zhi Yue at around 4:30pm when he returned to the qin school. He shared with us some very useful information about how to select good quality guqins. 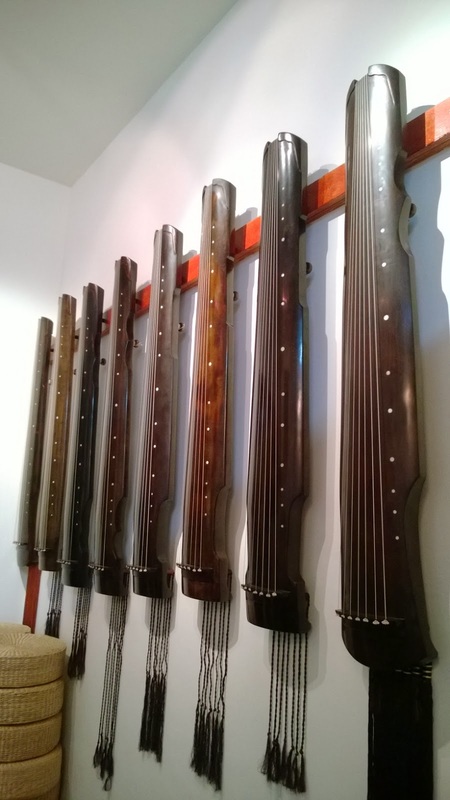 Group guqin lessons are also available at He Yue Zhai guqin school. Interested individuals may consider contacting the qin school directly at their Facebook webpage. Their guqin teacher, Maestro Zhong Zhi Yue is a member of the Singapore Chinese Orchestra.